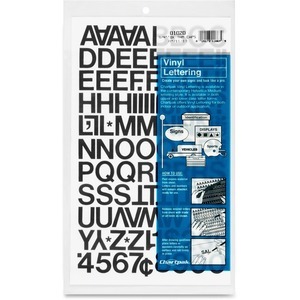 Easily apply these 3/4"" vinyl numbers and letters to clean dry surfaces, indoors and outdoors. Ideal for displays, signs, posters and equipment identification. Helvetica style letters and numbers have self-adhesive backings. Set includes uppercase letters from A to Z, each number from 0 to 9 with two number 1s and number 0s, and symbols: 20 periods, 7 commas, one dash, four asterisks, one dollar sign, one cent sign, one question mark and one exclamation point.